Dorothy is one of the most recognizable female movie characters of all time. From her signature gingham print dress to her ruby red shoes, no one will be able to mistake who she is. Not only is Dorothy’s attire make her a true pop-culture icon, but her strong will and independence also make her a girl ahead of her time. With her fierce independent spirit, Dorothy was able to navigate the often confusing landscape of Oz to eventually make her way to see the Wizard with all of her friends in tow. Never one to take credit for her accomplishments, Dorothy was also quite modest and humble – traits any parent would want for their own daughter. Send your little Dorothy on a trip through Oz to the Emerald City with this officially licensed Wizard of Oz child Dorothy costume. This deluxe edition of the costume comes with enough of Dorothy’s signature look to get her ready for a walk down the yellow brick road in style. The gingham print dress is over a white blouse for a look that cannot be mistaken. The blouse has short puffy sleeves, a crew-neck collar, and a back zipper for easy on and off. The full skirt has a built-in petticoat to give it bounce and fullness. Tie the two matching light blue hair ribbons around her pigtails for a look straight from the film. 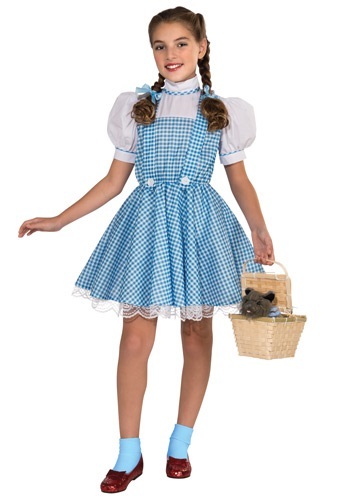 Add a pair of ruby red shoes and a Toto in a basket accessory and your little one will be ready to take on the personality of her favorite movie character this Halloween.